If you’ve recently got a lovely new piece of hardwood furniture, or are thinking about it, then one thing you’ll need to consider is how you treat the wood to prolong its life and make it look as great as possible. There is some debate about teak oil vs tung oil and which looks best. In this article, we will be explaining what each one is and how they differ so you will know all you need to before commencing with your project. In its natural form as an organic substance, wood naturally deteriorates over time. This is because of its tendency to absorb water and provide plenty of nooks and grooves for bacteria to grow and start breaking the wood down. Wood treatment is the process that is used to prolong the life of your wooden items and is necessary for all products no matter if they are remaining indoors or outdoors. Outdoor furniture, of course, is exposed to far more risks so it’s crucial that it is treated properly so it remains useful. Penetrative Wood Treatments – These are ones that are designed to be absorbed into the surface of the wood and protect the top layers of what you are treating. Most oil and wax treatments work this way, and offer a tough and durable protection. These are the easiest treatments to apply, and can simply be re-applied when the finish is starting to look a bit worn. You can even just cover patches with the oil again and it will look like it did when you first treated it. Exterior Wood Treatments – These, as the name would suggest, cover the top surface of the wood with a protective layer without absorbing within it. In this category are traditional paints and varnishes, and a whole new range of modern design chemical applications. These used to flake and peel, but the new formulas are designed to avoid these problems. Teak oil is a penetrative wood treatment that is intended to provide protection to wood by using natural substances. 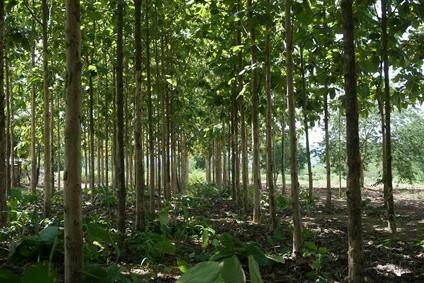 The products called teak oils do not necessarily contain any substances from the teak tree. The product is called teak oil because it is designed and marketed by the manufacturers as the best one to use when treating teak wood. The makeup of the oil will differ between brands, but often will be a mixture of linseed oil, varnish, and mineral spirits. It may also actually include small amounts of tung oil. If this leaves you asking “What is teak oil used for?” the answer is simply that it can be used to treat any type of wood so long as you want the particular visual effect that it provides. Again, this depends on the manufacturer and the ingredients that they use to make their teak oil, with the teak oil finish bringing a warm and vibrant quality to the colour of the wood. Teak oil is very easy to apply, and it can be sprayed, brushed or wiped onto the wood. It absorbs deep into the surface and won’t crack or chip. It also has the benefit of being UV resistant to further protect furniture in the garden. The oil does, however, change the colour over a long period, especially with teak wood. It normally transitions from a warm honey colour at the start to a patina colour later on. It also creates a hard layer on the surface of the wood being treated, which makes it very difficult to glue wood together after it has been treated. With the manufacture of teak oil in mind, you’re probably wondering what is tung oil made of? It’s actually created from the tung tree, which is native to China. It is produced from the nuts of the tree and has been used to treat wood for hundreds of years – often as a waterproof coating for the hull of wooden ships. It is often regarded as being one of the best natural ways to finish wood because of its effective protection and great colour that is produced by the end of the process. Once the oil has air-dried it becomes transparent. It is also completely waterproof and flexible. It is also commonly used on children’s wooden toys because, as a natural oil, it is completely non-toxic. tung oil has to be applied in a certain way to produce the desired effects, known as wet on wet burnishing. This involves sanding the surface in between the application of each coat, with each piece requiring between 3 and 5 coats, with a couple of days drying time for each. This long drying time is the main setback of using tung oil. You should also be aware that it doesn’t store well for a long time so you should aim to use it pretty soon after buying it. What’s better, Teak or Tung Oil? This purely comes down to how you want your wood products to look, and how much time you can set aside to apply the treatment. Tung oil is preferred by most people because of the end result it produces and effective protection it provides, but this comes at the price of a more complicated application process and longer drying time. If you’re looking for a quick and easy treatment, then teak oil will be a much better choice – it just won’t look as good as you would get with tung oil. Teak Oil VS Tung Oil: The Winner? Wood is a great material for making objects like furniture and flooring, but it is vulnerable to moisture and other factors unless it has been properly treated. Teak oil and tung oil are both very good at doing this job, but if you are trying to decide the best choice for you between teak oil vs tung oil, your decision will come down to how you want the wood to look, and how much time you have free to complete the process.